The Plant City Raiders and Durant Cougars set the stage for an all-Plant City championship showdown March 22 in the Saladino Tournament. At the end of the Saladino Tournament, Plant City High School was the last team left standing at Brandon High School. The Raiders went undefeated in their run to the final round, outscoring opponents 42-10 along the way and surviving tough efforts from Riverview (a 4-3 come-from-behind win) and Leto (a 3-2 win despite a late Leto rally) in the quarterfinal and semifinal rounds, respectively. The Durant Cougars turned out to be a pleasant surprise in the tournament, bouncing back from a 7-6 loss to Sickles in pool play to win four straight with a 4-3 win over Strawberry Crest in the quarterfinal and a 14-0 dismantling of Newsome in the semifinal round. That set up an all-Plant City finale that, like the teams’ first meeting of 2019, went in the Raiders’ favor. Plant City won its first Saladino Tournament final with a 4-1 score over Durant, led by junior closer Jarod Wingo in a rare start. Wingo pitched a complete game and gave up only one hit and one walk while striking out 10 Cougars. Durant’s only run scored — which came up in the top of the fourth inning when Frankie Martinez drove in Arpod Zsold — didn’t count against the PCHS junior as an earned run. 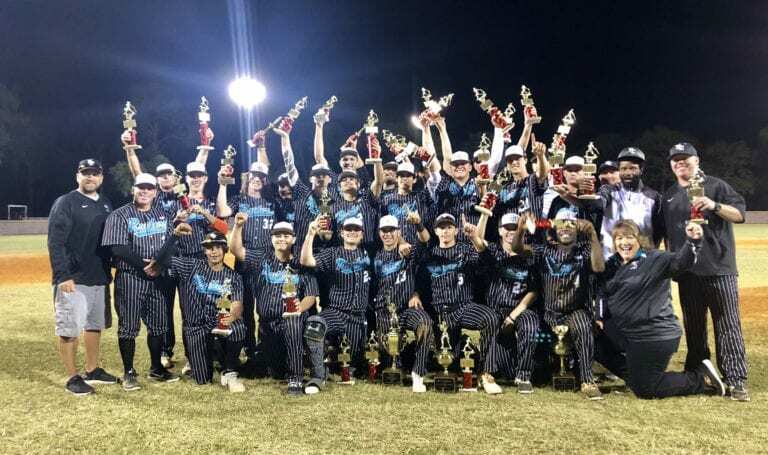 Mario Williams led PCHS at the plate with one hit, one RBI and one run scored, and the speedy sophomore also put up a perfect fielding percentage throughout the tournament. The Raiders’ championship win came with some uncertainty as Wingo went over the FHSAA-mandated pitch count for 16-year-olds during the game. The governing body eventually decided Plant City would have to forfeit the win. It was confirmed Thursday morning PCHS would both forfeit the win and pay a $100 fine. “”I take on full ownership of my honest mistake, rules are the rules, and we will move forward as a community, program and school,” head coach Mike Fryrear said in a Thursday morning text to the Observer and other media outlets. Though the Raiders will have to take the forfeit loss on its schedule as mandated by the FHSAA, whether they will be able to hang onto their title win in the Saladino Tournament’s own record books or have to vacate it there as well is still up in the air. Strawberry Crest looked strong in pool play, outscoring opponents 29-4 in the first three games. Results from the Chargers’ 8-2 win over Brandon weren’t available at press time last week, but big games at the plate for Tanner Kelley (1-for-2, three RBI, one run) and Alex Marshall (3-for-4, two runs, one RBI) paved the way for the win. Crest went on to the quarterfinal round against Durant but couldn’t find a way to finish the rally in the late innings. Durant scored two runs in the fourth and seventh innings, respectively, and held a 4-2 lead over the Chargers going into the bottom of the seventh. Though the Cougars performed well at bat, hitting .292 on the whole with seven total hits, it was senior pitchers Martinez and Carlos Curnow that held Crest’s previously hot offense to a .042 batting average.